If there was ever any evidence that Chasidic schools in New York are failing their students, an article in VIN is it. There is a cable channel in Brooklyn called BRIC TV. 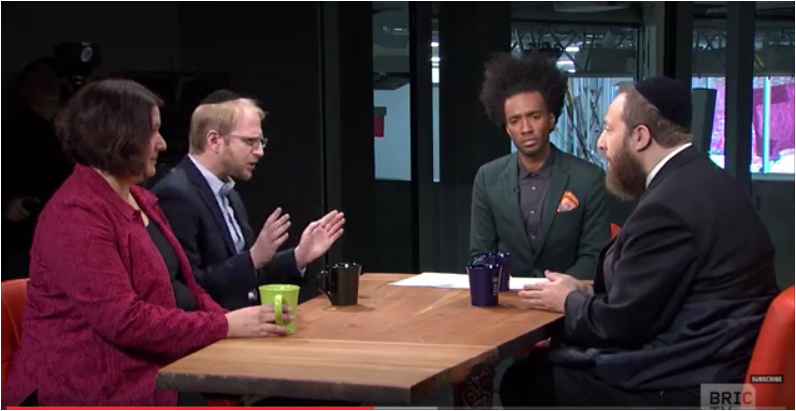 Yesterday, they featured a program with Naftuli Moster, Ezra Friedlander, and Jewish Week reporter Amy Sara Clark. The issue was whether those schools were indeed underserved with respect to an education. Anyone watching that show (video below) can see that the answer is clearly yes. Egregiously so. In fact there seemed to be no dispute about that. Except that Mr. Friedlander seemed to question just how significant a secular education really is - even as he agreed that they need to improve. Using himself as an example, he said that he doesn’t even know how to do the math to pay an 18% tip and yet he is functioning just fine in the real world. Why the dispute? The government is getting involved. And of course the Chasidic schools don’t like it. They blame Moster for ‘snitching’(Freidlander’s word) on them. Those like Friedlander that defend the Chasidic schools claim that much as they might agree that there ought to be improvement in that department, they claim that there is no money there for that purpose. They are on a shoestring budget and run deficits constantly, bills often don’t get paid. Why don’t they have enough money? That should be obvious. They are so poorly educated that they cannot get the kind of jobs where even a basic high school education is required. Add to that their typically very large families (10 or more children is not an unusual number) and its easy to understand. Freidlander claimed that if only they had the money, they would have the education. And then he the audacity to tell Muster that if he really wanted the change he would come with a check in hand to pay for it. The money they do have goes entirely into making their children good Jews. Except that we all know that is not true. At least it’s not the whole truth. While money is certainly an issue, Moster challenged Friedlander by pointing out that the Chasidic girls schools do have a secular curriculum. Even into high school. Boys have very little up until 8th grade and then nothing after that. Point being that there is enough money for girls. The purpose of these schools is to make their children good Jews. If girls can get a secular education in that context, why can’t boys? Friedlander never responded to that. The reason he didn’t respond should be obvious. It has little if anything to do with money – even as it is probably true that they don’t have any money. Chasidic leaders simply do not value secular education. They value only Torah study. And since they believe that girls do not have any obligation to study Torah (or perhaps aren’t even allowed to - according to them) they get a secular curriculum. Which is probably helpful when these girls get married and have to support their husbands and ever growing families. All while taking care of the children, cooking, and cleaning. Friedlander complains that Moster, an expatriate Chasid has an ulterior motive. Now that he has left that community he has some sort of vendetta and has in essence become a Moser (snitch) to the authorities. He claims that any improvement must come from within and not from an outsider like Muster. It is obvious to me that Moster’s motive for this is to improve the schools. There is no vendetta here. But even if there was, Moster’s actions will result in a better education for Chasidim. One may ask, ‘Why bring in the government?’ Why not let change happen from the inside – as Friedlander suggests? That they have been carrying on all these years without a secular education means that change will not come from the inside. It must therefore come from the outside. What Moster has done is force the issue. He has created an advocacy group (YAFFED) whose purpose is to improve secular education in these communities. They have put up billboards challenging the status quo – quoting Halacha that requires parents (or their agents via a private teacher or a school) to teach their children a trade. And they have asked the authorities to investigate those schools and see if they are following mandated guidelines for non public schools. Guidelines which state that they must have a secular studies program equivalent to the public school system. Guidelines that most non Chasidic – even Charedi schools follow. They have granted that request. It isn’t like the Chasidic schools are even trying. They have zero secular studies in the boy’s high school curriculum. ZERO! I doubt that they ever had any intention of having them – even if there was a surplus of money. Chasidic children are being short changed. And a lot of parents don’t like it. That they don’t complain about it publicly is because they know it goes against the Hashkafos of their community. They do not want to become outcasts. But one might not know that if they read the comments from members of that community to the VIN article. Most of them defend the system –some claiming to have successful businesses. One of them even claiming to have received a masters degree and running a successful business! But if one sees just how poorly their English language skills are one would be hard pressed to believe they even have an elementary school education - let alone an advanced college degree. The truth is that Chasidic leaders like that just fine. They consider speaking English well to be Chukas HaGoy – the biblical prohibition against following gentile customs. The problem with their interpretation of that is that Chukas HaGoy only applies to those customs that will lead one to idol worship. Speaking English well does not do that. What their attitude does do, in my opinion is make the most religious looking Jews among us look ignorant! Which in my view borders on a Chilul HaShem.